Ancient Egyptian jobs just like in any other ancient societies revolved around a few main areas of economic and religious activity. The Egyptian upper classes were mainly involved in the administration of the kingdom and belonged to the aristocracy, keeping watch over the empire as a whole. The job of dealing with religious affairs and administration were held by priests and scribes. Scribes, other than performing religious duties, also belonged to various other professions such as medicine and engineering. Jobs for the common people were generally passed down from father to son, for example a farmer’s son usually grew up to be a farmer, and played a critical part in society. The history of Egyptian jobs can be traced back to the inception of the first Egyptian dynasty. Of course the jobs associated with governance became available after the kingdom was established but jobs related to agriculture and trade existed even before that. Agriculture was mainly done around the River Nile and jobs in that area mainly consisted of agricultural work. Trade and commerce also existed in ancient societies and continued to flourish with the passage of time. Jobs of priests and administrators became established particularly after the establishment of the Egyptian Kingdom around 3150BC. The most important type among all Egyptian jobs was of course farming. Most of the people farmed the land and grew barley and wheat for bread, in addition to various vegetables and fruits. Another popular job was that of craftsmen which included carpenters, jewellers, leather workers, potters and every other craft you can think of. Relatively well to do people also indulged in trade and commerce, which offered bigger profits than your typical farming job. One way to increase your social status in Egyptian society was to become a solider which was considered a respectable job, and could allow a commoner to rise among the ranks. Finally, there were the jobs of priests, priestesses, scribes and government officials which we will go into more detail about later. 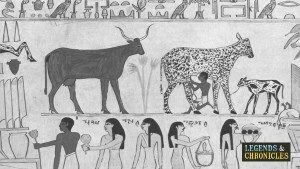 Of course a big part of the Egyptian work and Jobs revolved around farming. Various kinds of jobs from the government were available in ancient Egypt. Most of the time, however, these jobs were hereditary and thus remained in a small circle of aristocracy. Thus the son of an official grew up to become the same official for example. In certain cases however people from outside the aristocracy could also attain government jobs. The most important government jobs included the job of a vizier, military generals, administrator of finance and court officials. There were also various other noblemen who acted as state administrators in certain areas and were granted estates by the government for their services. Among the most important ancient Egyptian jobs were the jobs of scribes, priests, priestesses, and astrologers. The scribes, other than indulging in religious affairs, also held the job of documenting the legal affairs for the government. They also got the jobs of teaching in addition to acting in other professions such as medicine and engineering. The priests and priestesses on the other hand looked after the temples and administered the religious affairs of the kingdom. Astrologers were usually employed by the government to predict the impact of certain events or expeditions. The servants like most other professions were also determined at birth, with their family dictacting their career. This means that the children of servants usually ended up being servants themselves. These servants were mainly employed by wealthy households for cooking, cleaning, and other manual work. Serving girls acted as nannies for the children of the aristocracy. The jobs for servants also included working in the fields and helping the masters. Male servants working for the royalty were involved in building projects and sometimes were sent to fight in the military. Servants had restricted rights and could not inherit property or land. Baking was a typical job for the ancient Egyptians to partake in. Engineers and architects had some of the most important jobs in ancient Egypt. These jobs include the construction of grand temples and religious edifices in addition to overlooking the construction of pyramids. These engineers and architects had a vast number of slaves and servants at their disposal that could be used as manpower in the construction projects. The pyramids and grand temples sometimes took decades to complete and the king was free to employee as many slaves as he liked. Engineers and architects used various innovative techniques for the construction of grand monuments. The actual builders of the pyramids and temples were the slaves and servants who worked under the supervision of the engineers and architects. Other than the hereditary slaves, the king could also use his subjects in building projects. The lives of these builders were quite harsh compared to the lives of common people.Jobs for the artists on the other hand mainly included decorating the homes of the wealthy Egyptians in addition to the painting of tombs and temples. Craftsmen were also employed in building projects and were delegated the tasks of cutting stone and creating sculptures. The job of a soldier was considered one of the more respectable in all of Egypt at the time. Thus this was among those ancient Egyptian jobs that were coveted by the common people and they could use it to raise their social status. The most common form of job in the military was that of the footman. The new recruits were put through rigorous training process where they were taught wrestling, the use of weapons, and various military tactics. The jobs of the entertainers mainly revolved around music and dance, and wasn’t a role for everyone. The performance of music and dance was an essential ingredient of religious and social life. Large numbers of musical instruments and inscriptions have been found belonging to that era which signify the importance that music and dance enjoyed in ancient Egypt. Dance and music were essential in religious as well as secular festivals of ancient Egypt. Slavery was an important part of life in ancient Egypt. Other than being captured in a war, people could be enslaved for various reasons such as failure to pay a debt, poverty, and punishment etc. Jobs for salves mainly comprised of manual labour and they were expected to help their masters in agriculture and other manual tasks. 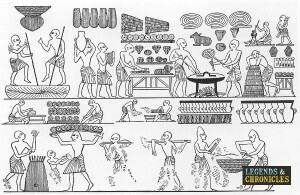 Ancient Egyptian jobs related to almost every sphere of life, from agriculture and commerce to administration of religious affairs and national defence. Agricultural jobs were the most common because most of the people were farmers. Government jobs, on the other hand, were mainly reserved for the aristocracy. For the Egyptian who wanted to grow in status the military proved a critical job for common people to improve their social standing.